With picturesque landscapes, great food and unique wildlife, Tasmania is a dream to experience. Although planning a Hobart to Launceston road trip can seem a little daunting, since there is so much to see and do and only so much time to do it in! But if you do your planning right, you will end up with an Australian road trip adventure you will absolutely love! For us living in Australia, we are lucky enough to have some pretty amazing road trip options as we explore from one side of Australia to the other. We recently shared some of our favourite local road trips from Brisbane, however one of the most memorable Australian road trips we have done so far is Hobart to Launceston. A Hobart to Launceston self-drive holiday is a perfect way to experience this beautiful and scenic part of Australia that happens to be separated from the mainland. We share our Tasmania 8 day self drive itinerary to guide you in planning the Tassie adventure you’ve been dreaming of! 1.7 How Much Time Do You Need For a Tasmania Road Trip? 1.8.1 Have you been to Tasmania? Our Tasmania road trip happened a bit by accident! At the time we were planning a trip to China. Our tour was booked and a deposit was paid. We were also trying for a family. After a bumpy start, we were over the moon to find out we were expecting, with the first of the Connors girls. I reassured Simon I would be fine for China… but by around late April, it wasn’t looking like a great option. Morning sickness struck in a big way. I was having aversions to every food that wasn’t fresh sandwiches or Twisties and I was downright exhausted. Sure, it might have eased up in time but we didn’t want to risk it so we regretfully forfeited our deposit for China and starting planning a babymoon closer to home. We decided it was time to do the Tasmania winter holiday we had been meaning to do for a while, and thankfully it turned out to be one of our favourite holidays together. We flew Brisbane to Hobart with Virgin Australia and arrived early in the day to Hobart, picked up our rental car at the airport and headed into town. We had a few hours until check in time, so we headed to the popular Salamanca Markets for a wander around and some lunch. Depending on the time of day, you may be able to check in straight away at your accommodation. Salamanca Markets are pretty much a foodie delight, although it can be both torture and pleasure when pregnant with so many delicious smells! Pretty much I spent the trip always starving but hardly anything seemed to meet the cravings. Urghhh! We did enjoy a German sausage style hotdog to share and picked up some sweet treats for later during our market visit though. We stayed at Hadley’s Orient Hotel, which suited us well and was close enough to everything. Although since we had a hire car, location was not as important for this trip! After we checked into our hotel, we went for a drive up to the top of Mt. Wellington. It was mid afternoon by this time and being winter, the sun went down early. Not to mention how freezing it was amongst the clouds, but a must do natural attraction when visiting Hobart, just for the views! You would see more earlier in the day though, so we would definitely recommend if you are visiting Tasmania in winter that you head to Mt Wellington no later than mid afternoon as the sun goes down quite early during the winter months. At the top of Mt Wellington there is a viewing platform and lots of opportunities for walks and photographs. Being pregnant and winter, we did not get a chance to fully appreciate the many things you can do at Mt Wellington, however if you have the time, you could easily spend a full day exploring the mountain and what it has on offer. Make sure you have warm clothing because even in the summer months it can have some serious chill factor up the mountain and you want to be prepared. Find out more about visiting Mt Wellington here. Dinner recommendation: Head back to Salamanca Place for a meal at one of the many restaurants that line the street, You will have loads of choice and the atmosphere is great. Our first night involved dinner at an Italian restaurant at Salamanca Place. We kicked off our first full day in Hobart by driving to Bonorong Wildlife Sanctuary. We love wildlife encounters on our travels and it was only about 40 minutes outside of Hobart. Bonogrong is a nature reserve for injured wildlife. It is not a zoo, however you do get a great educational experience. 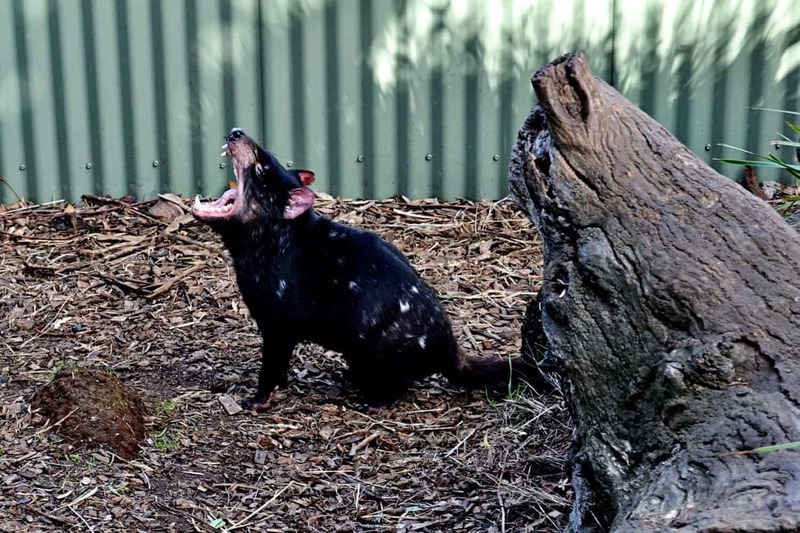 There are talks from the wildlife carers and plenty of up close and personal encounters with the animals in their enclosures, such as this Tasmanian devil. You can also talk a walk with the kangaroos and feed them, which is a really fun experience for kids if you are doing a Tasmania family holiday itinerary. After our visit to Bonorong, we headed to the Cascade Brewery for lunch. 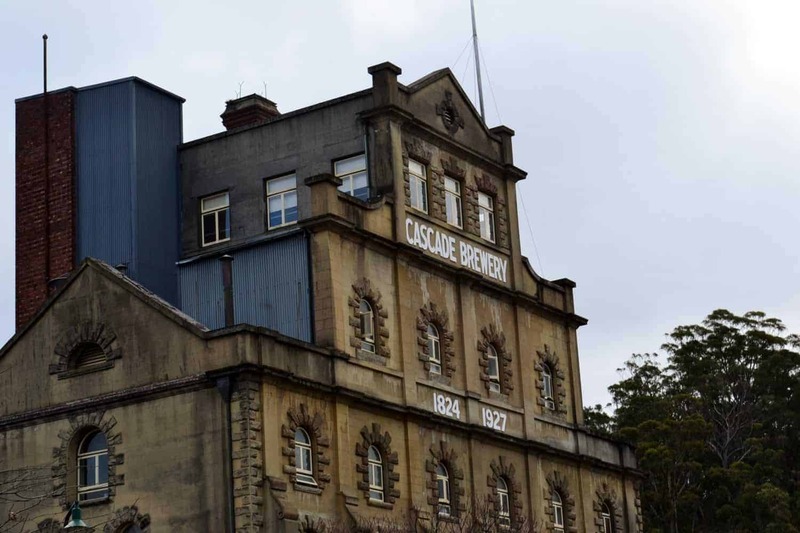 The Cascade Brewery is a famous Hobart icon, with their beer and ginger beer drinks exported around the world. We did not do the Cascade Brewery tour on our visit, however if you did want to, it only takes around an hour. No doubt Simon would have loved it, but being pregnant and hating beer… it probably wasn’t a great combo for me. Instead we had the most amazing stout pie for lunch. BEST PIE EVER! And we took a walk around the beautifully landscaped gardens as well. The brewery is a perfect spot for lunch and you really do need to try that stout pie! After lunch and exploring at the Cascade Brewery, you can visit the nearby tourist attraction – the Cascade Female Factory Historic Site. This is not an overly exciting attraction, however it does have some interesting history and at certain times of the day they do historic reenactments. For this reason, you may want to check the website or call in advance to find out when their next reenactments are so you can experience the performance. Dinner recommendation: For your second night in Hobart, head on down to the harbour and enjoy a night at the Drunken Admiral Seafood Restaurant. This is a very popular iconic restaurant near the dock. Simon loved it and normally I would too but seafood was not very appealing in my precious state of up the duff! We will be back again next visit and have friends that visit there every time they are in Hobart, so it is definitely worth adding to your itinerary. On day 3, head to Port Arthur for an action packed day of history and nature! This was by far my favourite day during our Hobart to Launceston holiday. We got up early to drive to Port Arthur to start our outdoor adventure portion. First up was our Tasman Island Wilderness Cruise with Pennicott Wilderness Journeys. Of all the experiences we have had on our travels, this is a stand out and we could not recommend it more! There is a similar cruise they run on Bruny Island which is meant to be amazing too so make sure you lock this in for one day in Hobart because it is AMAZING! The cruise is 3 hours long in a custom built boat that allows you to get right up close with the natural environment as well as with the wildlife. Seals, birds, dolphins. The boat takes you past the massive towering cliffs of Tasman Island, through caves and rocky tunnels and over some pretty wild waves. It borders on white water rafting in places, and yet I am still amazed there was not a single moment of morning sickness during the cruise. It is an early morning as Port Arthur is around 90 minutes from Hobart, so you will need to leave Hobart early in the morning. Take care on the roads, especially if it is part of your Tasmania winter itinerary, as there can be a lot of fog and the roads are super windy. This means while the distance may seem short, it may take a bit longer than expected. You also need to take care with wildlife on the roads. 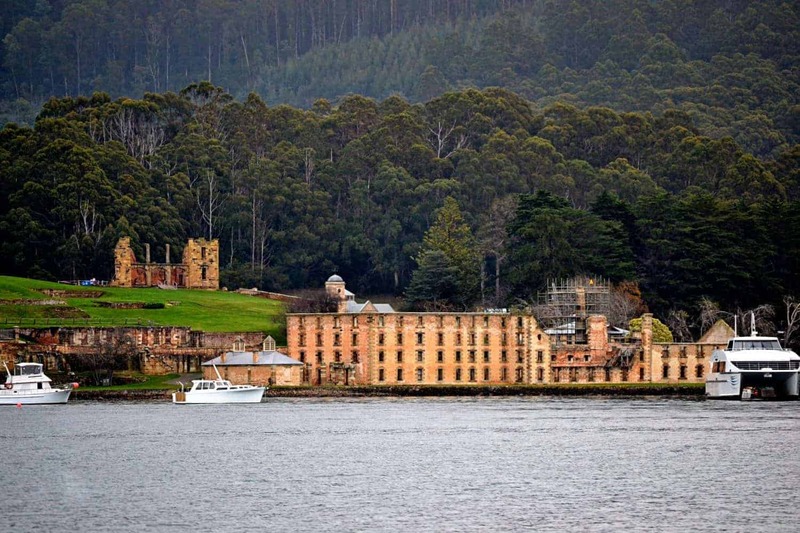 Following the cruise, head on over to nearby Port Arthur Historic Site for a walking tour and exploration. This is another interesting attraction worth the visit and it is right near the starting point for your adventure cruise, so you might as well experience both in one day. This was one of my favourite places to visit, both because of the incredible and also very tragic history Port Arthur holds, but also because of the beautiful views. Have lunch in the Port Arthur Historic site cafe before you kick off your tour. There are options for several different tours, including self-paced, guided tours and there are even some spooky night tours and ghost tours available. We headed back to Hobart around sunset, stopping off for dinner at a pub along the way to break up the 90 minute drive back. Such an amazing day! Do take care on the roads after the sun goes down though as there is a lot of wildlife around and the roads are quite windy so keep your eye out and keep to a cautious speed if you are doing a self drive Tasmania trip. I really want to reinforce that. We set off for Strahan around check out time from our Hobart accommodation and drove to our next destination. If you are doing a Hobart to Strahan self drive, give yourself extra time. Unfortunately this was one part of our road trip that did not go so great. Firstly, the expectation of how long it takes to get from A to B in Tasmania can be way off. We expected this drive to only take about 2 and a half hours, based on our post-trip research. It was much longer! The distance from Hobart to Strahan is misleading when it comes to maneuvering the winding roads. This photo is along the way passing through Queenstown to show you how windy and hilly the roads were. It was one of those ‘I need to stop before I’m sick’ breaks. Oh boy, this part of our trip was rough! While the scenery along the drive is beautiful, be very mindful if you or someone else in the family suffers motion sickness. Tasmanian roads are bad for it… only in my case it wasn’t just motion sickness, but a cruel combination of motion sickness and morning sickness. And I won’t even go into detail about the incident in the rental car just outside Strahan (let’s just say there was nowhere to pull over on the narrow road before sickness struck.. ick!). 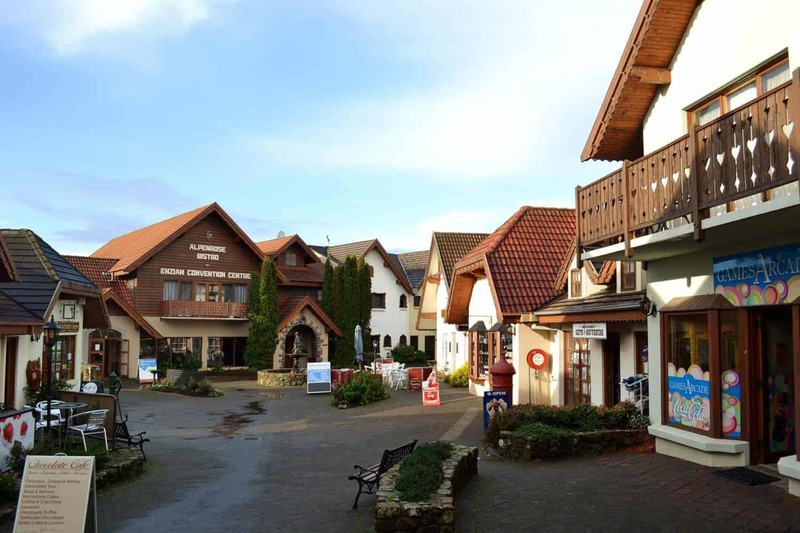 We arrived in Strahan in the mid afternoon and checked into our accommodation – Strahan Village. I needed a bit of a rest before we went exploring though as the drive wrecked me a bit. So we had a little downtime before we went out for a look around town. Our accommodation location was great, with some wonderful, scenic views due to it being situated up on a hill. The room itself was basic and a little noisy, almost resembling student accommodation. But it was adequate for a one night stay. We had heard amazing things about Strahan, hence the reason we added it as part of our Hobart to Launceston Tasmania road trip. However, it was the off season when we visited and the town was in hibernation. A lot of restaurants and shops were closed for the winter season, so we really only had the choice of the pub for dinner. Thankfully the food was fine and relatively quick. We didn’t see too much more in Strahan, checking out the next morning. This meant there was no time to do either the stream train or the Gordon River cruise… an experience we deeply regret not incorporating into our itinerary. With this in mind, we would highly recommend extending your stay to two nights in Strahan, or skipping it entirely if you visiting in winter, simply due to there not being a lot to do during this time if you are only in town for one night. It is definitely a stop worth including if you have the extra time though. The next morning we were up and ready for yet another big drive… bigger than expected… to Cradle Mountain. Again, we really cut ourselves short with the time we needed to explore the area, with the road trip from Strahan to Cradle Mountain also taking much longer than anticipated (with the added delay of extra stops to ease my morning sickness). We arrived at our Cradle Mountain accommodation, Lemonthyme Lodge Wilderness Retreat in the afternoon. I was feeling pretty rotten by this time so I was content to enjoy the cosy atmosphere of our wood cabin while I recovered from the drive. Unfortunate though, as it would have been great to go for a walk through the surrounding rainforest. It was raining lightly that afternoon also, which mean out window of opportunity to go for a bushwalk was not really there. It was incredibly tranquil to enjoy our fireplace and wood cabin though, and make friends with the crow who was hanging out on our veranda. Cradle Mountain is a beautiful spot and very romantic too. It is a great place to visit in winter in Tasmania. Dinner recommendation: You must have dinner at Lemonthyme Lodge if you stay here. We enjoyed a fabulous dinner in the Lodge restaurant that night. This was one of the best meals of the trip and the atmosphere in the large main cabin was really cool. We had a great chat with the owner as he brought out our different courses, as part of a 3 course banquet we opted for. Very memorable! 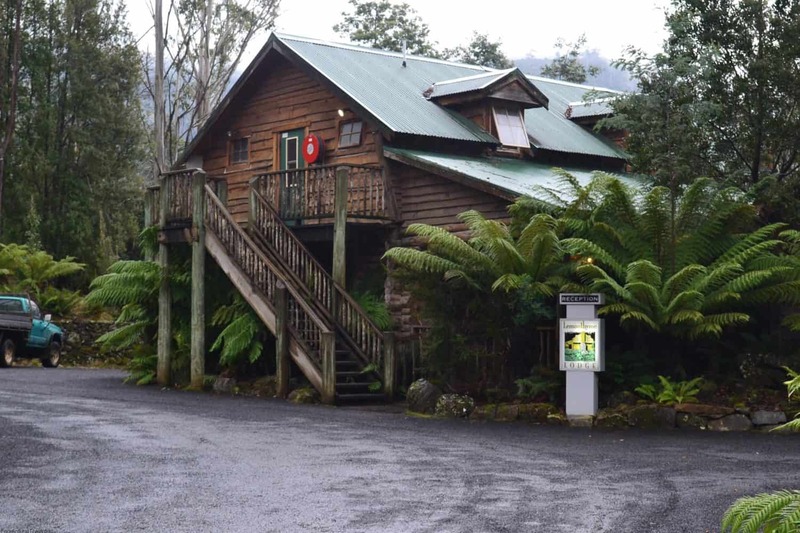 The next morning, our final leg of the Hobart to Launceston road trip, as we headed from Lemonthyme Lodge to our very own Swiss inspired village accommodation – Tamar Valley Resort. Tamar Valley is a little way from the Launceston city centre, in Grindelwald, but it was worth the extra distance. It transported us back to good memories of our 2010 Switzerland visit. There are quite a few things you can do at the ‘resort’, which makes it a perfect accommodation when visiting Tasmania with kids. There is everything from mini golf to paddle boats and a great playground. It even had a jumping pillow. We arrived a little after midday to Tamar Valley Resort, so our first stop was to their onsite restaurant for lunch – Alphenhouse Bistro. Their soup of the day was amazing and just what I needed to settle my stomach. Afterwards, we headed into Launceston for a look around, with no particular goal in mind. The weather was miserable so we ended up catching a movie at the cinemas. Not a very exciting travel experience, but sometimes you just need some down time and a funny movie. It was still raining the next day so we sadly skipped some of the outdoors Launceston attractions that we would have liked to see, and instead headed for some mostly indoor activities. We drove to Beaconsfield Mine and it was actually really interesting. They have created some wonderful interactive displays and plenty of educational stuff, aimed at kids and adults. Plus the place made history back in 2006 with the 2 miners trapped for 14 days who managed to survive. 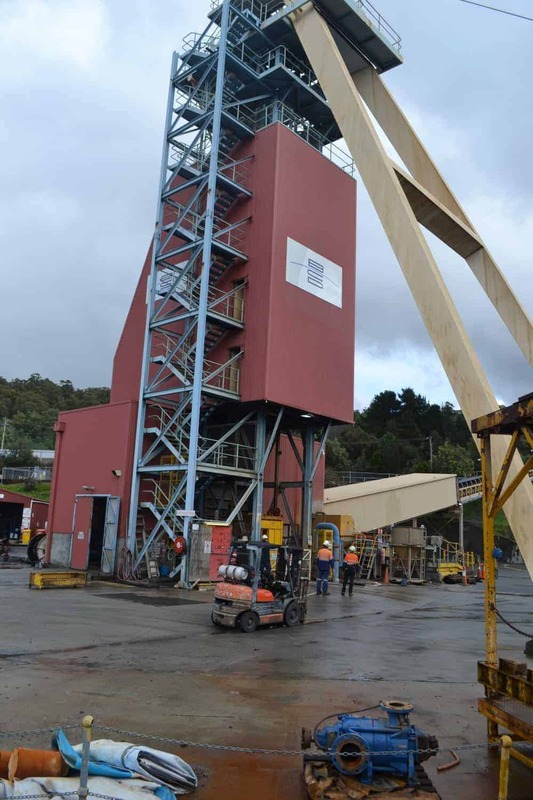 In fact what was also pretty cool was the fact that the functional part of the mine was closing a few weeks after our visit so we were lucky to see the activity of Beaconsfield Mine still active. We then had a quick visit to the Platypus House nearby. We had the chance to get up close with platypus through the glass displays plus even closer with some echidnas who wandered around the enclosure we were standing in and had a meal at our feet during the tour. Very cool. If you are looking for ideas on what to do in Launceston with kids, this is a must! Dinner was at a pub back in Launceston and the food was pretty good. Simple, hearty pub meals – perfect for the pregnancy appetite! Sometimes a simple, along the way find can turn out to be a great choice! Back to the airport to drop off our hire car and fly home to Brisbane around the middle of the day. We had a great time on our Hobart to Launceston self drive holiday, despite the morning sickness interfering with a few of our plans. However, in hindsight, we would have preferred an extra day or two in most of the destinations. It simply wasn’t long enough to really appreciate the sights and local offerings. Our next Tasmanian holiday will definitely include the Gordon River cruise when visiting Strahan and a chance to experience a lot more of Launceston. Especially Cataract Gorge. Tasmania is a picturesque family holiday destination, with beautiful scenic locations, a friendly atmosphere and plenty on offer for foodies or adventure travellers alike. We hired a car from Europcar for our Tasmania self drive Hobart to Launceston 8 day itinerary, picking it up at our starting point at Hobart airport and dropping it off at Launceston airport just before we headed home. We hope this 8 day Hobart to Launceston drive helps you to plan your own Tassie adventure. It was a great time frame to see a lot of what Tasmania has on offer, when short on time. However, there’s a good chance you may not have 8 days, so whether you are travelling for a longer or shorter time frame, here are some different options for you to consider for your own Tasmania self drive holidays. If you have only 3 days in Tasmania, we recommend you focus just on the one major city. Due to the location of the airports, either Hobart or Launceston would be ideal for a long weekend stay, however if you want an express trip, you could drive from one to the other in just a few hours. If you did this, you would not have a lot of time to see much in between when taking such a direct route, but it’s definitely possible. If visiting Launceston over 3 days, we recommend incorporating a visit to Cataract Gorge Reserve and a ride on the Cataract Gorge Scenic Chairlift, plus some time in Tamar Valley. Include Beaconsfield Mine and the Platypus house, and if you are beer lovers, a meal and possibly a tour at the James Boags Brewery is a must! For a Tasmania self drive 7 day itinerary, skip Strahan and Cradle Mountain if you want to do the Launceston to Hobart drive or reverse. Alternatively you could do a look either in the north or south, focusing on Hobart to Strahan and back or Launceston to Cradle Mountain and back. Follow our Tasmania self drive 8 day itinerary, however add in an extra night in Strahan and either Cradle Mountain or Launceston to allow you time to enjoy more of the attractions, such as the Gordon River Cruise and Cataract Gorge. If you have 2 weeks in Tasmania, you can fit a fair bit more in and we would definitely recommend incorporating Wine Glass bay area into your Launceston itinerary. 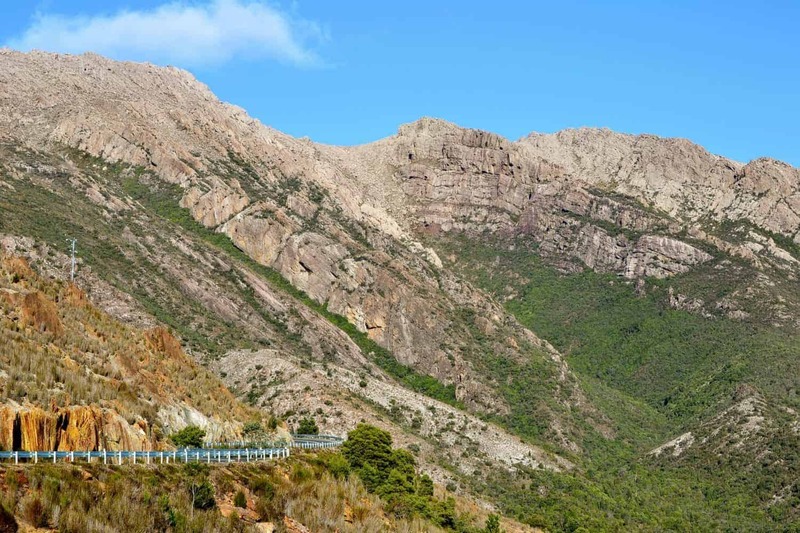 This region sounds beautiful and very scenic, plus it gives you a chance to also experience some more of Tasmania’s coastline and beach areas. Although if you are visiting in winter, you might not want to go near the water! Freezing! How Much Time Do You Need For a Tasmania Road Trip? We recommend more than 8 days definitely. This was a very express trip and meant that we did not get to see and experience everything we wanted to. I would say 10-14 days would be an ideal amount of time if you have it available, as that means you will not have to rush as much and you will get more chances to see and do the best things in Tasmania. There is so much of this beautiful state to see, and a lot of history and scenery to enjoy. If you are travelling with kids, you will want to allow a little extra time anyway as things do not always go as planned when travelling anywhere with kids. Especially road trips with kids, so making sure you have a little extra down time or time to stop if little stomachs get sensitive on those winding roads. To get around Tasmania, you are best to have your own hire car. There are several different companies available for hire cars, and they have cars of all sizes to suit your personal needs. We had a hatchback, which suited as fine when it was just the two of us. If you are travelling with family, you will want a bit of extra space for comfort during the drives. If you would prefer not to have your own private transport, it will make it a lot more challenging getting around as Tasmania is large and sprawling. However in saying that, there are loads of tours and day trips that take you to see different points of interest, and there are buses to take you to the different towns and cities as well. It isn’t impossible to see Tasmania without a hire car, but not as easy! The distance from Hobart to Launceston is approximately 2 and a half hours. The distance from Hobart to Strahan is approximately 5 hours. The distance from Hobart to Cradle Mountain is approximately 4 and a half hours. You can find more approximately travel times for Tasmania on the Discover Tasmania website. Yes! Port Arthur is such a great day trip. I am a little too excited by historic prisons after a career in corrections up until last year though but it is a really interesting visit. Quite a drive from Hobart but nice scenery on the way at least. The mention of Strahan roads will always make me cringe but the overall journey is amazing lol Tasmania is such a beautiful place. I know we need to go back in the warm months next time though. To Strahan especially. What an amazing trip! It looks like y’all had a great time. I haven’t been Tasmania, but you make it look so very inviting! I’m a Tasmanian originally and met my husband at Cradle Mountain. It’s always interesting reading tourist things about your own home state. I agree with the travel time, there’s hardly any traffic but the roads are slow going. It’s interesting you went up the West Coast, most people do the East Coast! That cruise on day 3 looks amazing. I would love to see Tasmania but I can’t drive on windy/hilly roads so I would have to do a tour or something. I have never been to Tassie but it is definitely on our list. This is exactly the way I would like to do it too. It is so beautiful. I hate the cold but some places seem designed for it. Tassie is one. The scenery is stunning & there is so much to do. Take 2 weeks, 8 days isn’t long enough. Ahh…my favourite place. We’ve done exactly the same trip a couple of times and experienced Cradle Mountain in the snow. I can’t wait to go back! It would be beautiful in the snow. Lemonthyme Lodge where we stayed, with the fireplace would have been dreamy. One day! Isn’t it amazing how 8 days in such a tiny state is not enough, so much wonderful scenery to check out in Tasi. On another note; I think you made the right decision having your baby moon at home in Australia. What a lot of people don’t realise is that pregnancy is not often covered by travel insurance as it’s a “Pre-existing Condition”. Yeah, that’s another very good reason Sally. The few insurances that do cover it cost a small fortune too. I wouldn’t have enjoyed China at the time. My food aversions were extreme and the coach tour would have been messy. Great post. 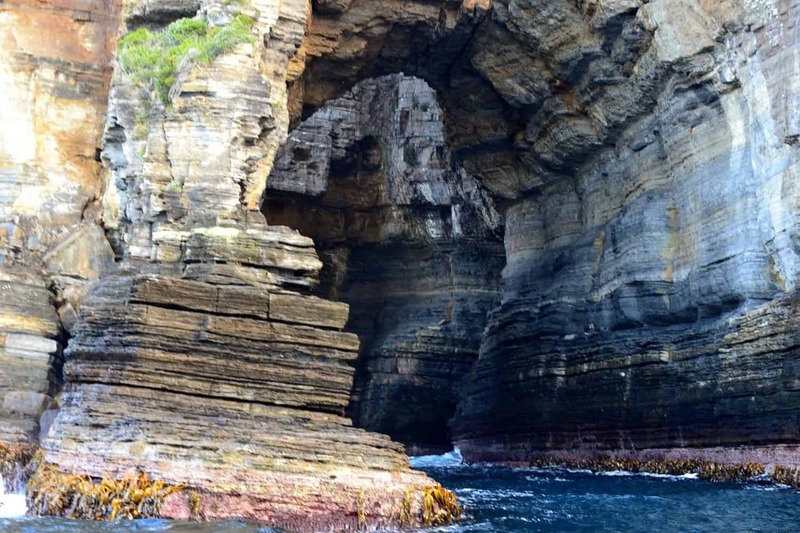 The Tasman Island Wilderness Cruise sounds amazing. I would love to do this someday. It was be so cool to see some dolphins. 🙂 Thanks for sharing your trip and the wonderful pics. I could not believe how many dolphins we saw. They said there was around 100 which was crazy as I never realised their pods were so large. Very exciting experience. I loved our time in Tasmania – stuck to Hobart and the East Coast so one day I will go back and explore the rest! There is so much more we want to go back and see too but Hobart is pretty amazing at least! We were planning a Christmas trip and I was not sure if Tassie had enough to see for a week. This article has given me some great ideas. Nice! Stunning photos. 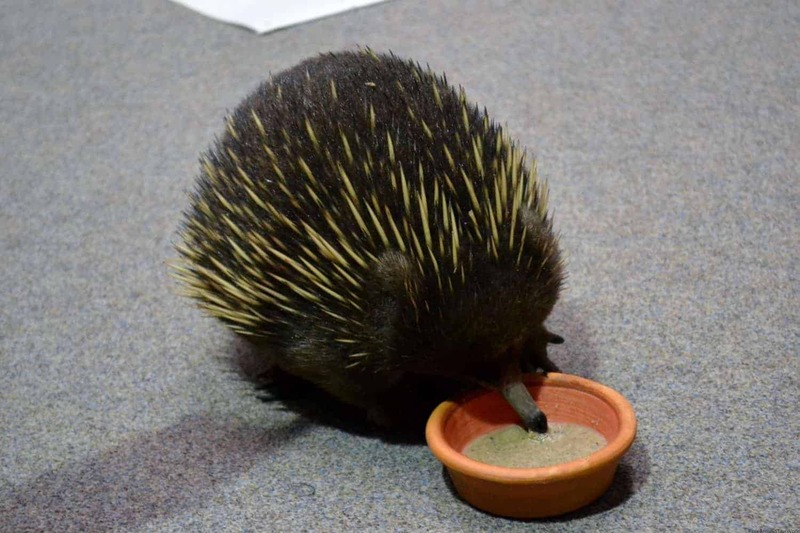 I don’t know but watching echidna is so adorable.